DOD FX 51 juice box modification. He wanted changing the clipping diodes for a led red +1N34A . I did it but the sound is not like I thought . That sound typically like a green ringer, a kind of strange note decay. Beside, I would like to add gain , bass response, and output level . I put a 1M pot. instead the 140K in the feedbackloop's first AOP to increase the gain, works good . then I cut one C12's leg to put out the gyrator (which cuts to about "800Hz" like a TS does actually) but nothing change, the pedal still bassless. for the low output level I thought increasing the 47K in the feedbackloop of the second aop , but I think doing that will have effect on the "low" control, right ? The fact is that pedal isn't mine and I don't want destroying that circuit in cuting/bypassing/trying component, the pcb quality is really low and I think it won't love that, by the way. So, have you got ideas to increase bass response and output level ? Someone has already mod that pedal ? Re: DOD FX 51 juice box modification. Looks like the TS mods would apply to the diodes on the opamp feedback loop. Beside, I would like to add gain, R3. I put a 1M pot. instead the 140K in the feedbackloop's first AOP to increase the gain, works good . then I cut one C12's leg to put out the gyrator (which cuts to about "800Hz" like a TS does actually) but nothing change, the pedal still bassless. for the low output level I thought increasing the 47K in the feedbackloop of the second aop , but I think doing that will have effect on the "low" control, right ? He might like D1 and D3 as is, but going up in threshold [such as add another diode for assymetric] will boost output. Sounds kinda like you know what you're doing, there's info on Gyrators, I just remember if it was Mark, RG and who else helping Ricky Vance figure out tone controls/gyrators. So, actually , that box was designed to add drive to an amp already saturated. that explains, I think, the low gain level and output level. Actually the diodes may be removed without losing the tone of that pedal. 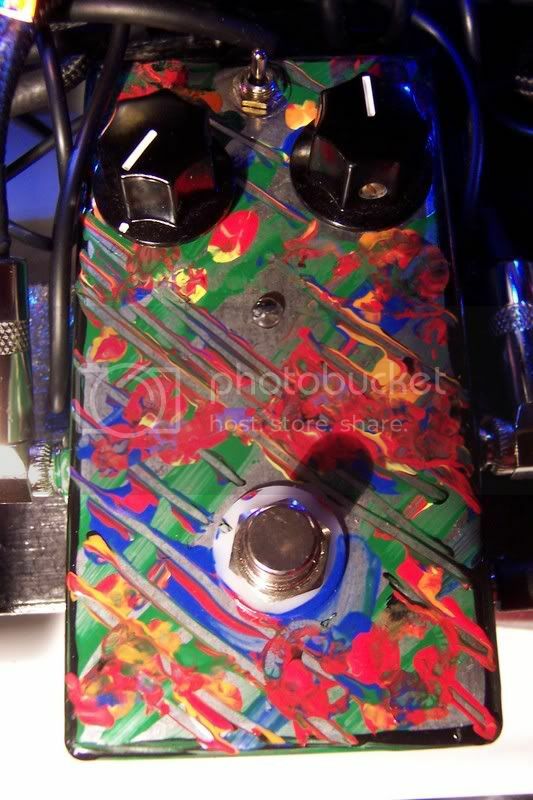 DOD made , at least one time, a good and really useable pedal ?